If you have a small business, an online business or are a creative or artist you know how important it is to provide valuable content to your audience. Your content (blog posts, podcasts, graphics, images..) help you to build a relationship with your followers and establish trust and credibility. Most people use social media to connect with their ideal clients or customers. This is a great place to connect but if you're like me, you often feel stuck and frustrated. What do I post? I know that captions and content are important but I don't have anything to share. Just a few months ago I struggled with now knowing how to serve and connect with my audience and then I had a thought... if I had a bank of content that I could draw from I would never need to worry about what to post. Seems so obvious, right? While it seems like a logical solution you kind-of have to actually have a content library. What is a content library exactly? A content library could take many different forms and come from several different sources. The most common form of a content library would come from your blog. If you've been a persistent and consistent blogger you probably already have a ton of helpful content you could share with your audience. Now I know you might be thinking, "but I already shared that content, I can't share it again, people would notice." I've gotta drop a truth bomb here. While a few people may have seen your post I would say even less people clicked through to your content. Remember that a very small number of your social media following sees your posts (unless you pay to boost it or run it as an ad.) It's more than OK, in fact you SHOULD repurpose your content and share it more than once on social media! Other content may come from your podcast, from your YouTube channel or other content you have created in the past. How do I create a content library? You want to be able to easily look at your content library so you can quickly grab links to the content you want to share. I use a spreadsheet to keep track of my content and stay organized. In each of those 7 categories I try to come up with 4-5 posts for each. 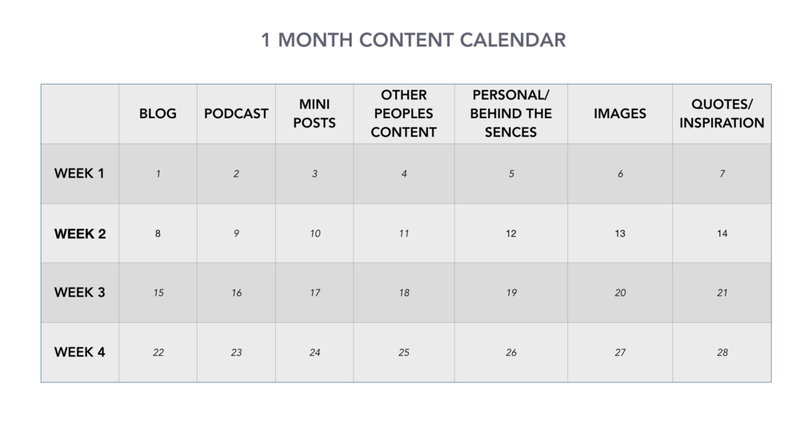 If you can create those 4 posts in each of the seven categories suddenly you have 28 days of content! It's crazy easy but for some reason we try to complicate things. What would it look like, if you could schedule 3 months of social media by using your content and repurposing it? You can use content that you have already created and share it once a month for 3 months. Now imagine if you had 90 peices of content - you could share that content once every 90 days, or 4 times a year.